Former Minister Yoav Galant criticizes Benny Gantz, who has declined to give interviews since announcing he is running for the Knesset. 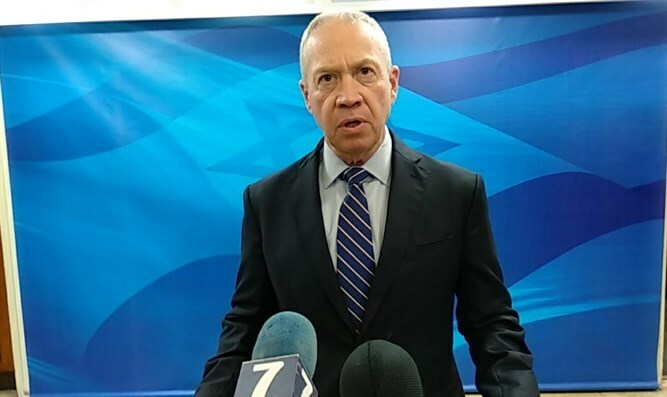 Former Minister Yoav Galant on Saturday took a shot at former IDF Chief of Staff Benny Gantz, who recently founded the Hosen Yisrael party (Israel Resilience Party) ahead of the April elections. "Benny Gantz isn’t talking,” Galant said at an event in Ness Ziona, referring to the fact that the former Chief of Staff has declined to be interviewed and present his platform, despite planning to run for the Knesset. “I think he knows why he isn’t talking. I also know why he isn’t talking, and thousands of officers who served under our command also know why he isn’t talking. When you have nothing to say, you do not speak,” he continued. Asked what exactly he meant in his comments, Galant replied, “The picture is clear and I will not interfere in how the left divides its mandates." He discussed the possibility that former Defense Minister and Chief of Staff Moshe Ya'alon would run for the Knesset together with Gantz and said that "this is a connection between one who has no opinion and one who has no mandates." Galant noted that as far as he was concerned, Prime Minister Binyamin Netanyahu could continue to serve even after being indicted. "The only thing relevant here is the law and the law states that it is possible to serve until a final judgment," he said. Galant announced this week that he would leave the Kulanu party and run in the Likud primaries for a spot on the party’s list in the upcoming Knesset elections. As such, Galant resigned as Knesset member and Minister of Construction and Housing on behalf of Kulanu. Netanyahu is seeking to appoint Galant as Aliyah and Integration Minister. That appointment has yet to be brought for approval before the Knesset plenum.